I subscribed to the feeds of Action for Happiness on Facebook. I enjoy following these kinds of non-profits that promote health, happiness and well-being. They offer insight and validity to life when you need it. Three fundamental needs for human wellbeing: autonomy (feeling in control), competence (feeling capable) and relatedness (feeling connected). When I read that post, at that moment I realized why I need a change. At home, these fundamental needs for well-being are met. At work, not. I’m missing one of these fundamental needs. I’ve been searching for what what missing. And now it has a name. I’m missing the A. I don’t have the autonomy I need to feel fulfilled in my job. 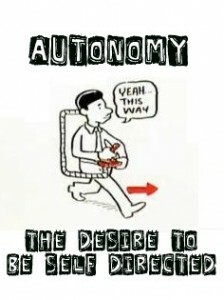 The “autonomy” isn’t real. And the sad part is… is has nothing to do with the kids, the teaching, the standards, the curriculum, the professional development, or even the parents. This has to do with micromanagement. And that, I can’t take anymore. It’s time for a new chapter, one the A.